Mrs. Evelyn Grace Manning passed away peacefully surrounded by loved ones on Sunday December 4, 2016 at Williamston House in Williamston NC. 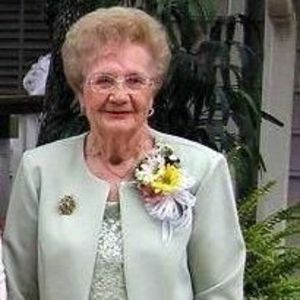 Mrs. Grace was born May 8, 1926 in Pitt County to the late Levi and Almeta Barrow. She grew up in Pitt County and made many memories there. She graduated from Bethel High School. She lived in Bethel where as the story goes Bill Manning rode by, saw her in the yard swinging, turned around came back to meet her and that was the start of a long life together. Mr. Bill and Mrs. Grace were married on December 29, 1944, and were married for 44 years until his death in 1988. They ran Bill Mannings Grocery in the Sandy Ridge Community for 23 years. After the store closed she worked at Williams Red and White for 4 years, then she worked at Walmart as a phone operator for 16 years. Mrs. Grace loved working in the yard and was known for a pristine cut yard full of lots of beautiful flowers. She was an excellent cook and shared meals with many "homeless" neighborhood people at the store. She also kept an emaculate house. Sunday nights were always family night at Mrs. Graces. After supper it was TV night. Mutual of Omaha's Wild Kingdom and Wonderful World of Disney were Sunday nights programs to watch. She loved doodling and drawing cartoon characters. She made a safe haven for her great grandchildren providing hot dogs, cheese toast, and sweet tea while watching Golden Girls and Gunsmoke. She took many trips with Freddy and Paula to Myrtle Beach where they enjoyed ice cream trips. Mrs. Grace was predeceased in death by her parents, husband, brother, Jimmy Simmons, and niece Kim Craddock. Those of us remaining on this earth and wishing to see her again are her children Phil and wife Ada of Williamston and Freddy and wife Paula of Orange City Florida. Her Grandchildren are Christie Tyson, Randy Manning (Linda) Holly Wynne (Eric) and Noelle Jernigan (Brian). She was proud of her great grandchildren Jacob, Caleb, and Abby Tyson as well as many nieces and nephews. She also leaves her sister Rosemond Guttroff of Pennsylvania. She leaves a special friend at Williamston House, Jimmy Purvis, to cherish her memory. The Family will receive visitors at the home of Phil Manning 1861 Holly Springs Church Road Williamston. Visitation will be Tuesday December 6, 2016 from 6-8 pm at Biggs Funeral Home. Funeral Service will be held December 7, 2016 at 2 pm at Holly Springs United Methodist Church. The Family wishes to thank everyone for their kindness during the last three and a half years, especially Dr. Corina Pogodina, Commuity Hospice, and the staff at Williamston House. In lieu of flowers, donations may be made to Holly Springs Methodist Church in Williamston, N.C.